Built between 1898 and 1902, Laxmi Niwas Palace was commissioned by Maharajah Sir Ganga Singh to serve as his royal residence. Designed by Sir Samuel Swinton Jacob, Laxmi Niwas Palace is constructed in an Indo-Saracenic style, an architectural movement popularized in the 19th century in British India. While driven by his vision of establishing a grand estate worthy of royalty, the Maharajah of the former state of Bikaner was also motivated to build the palace as a means to stimulate employment in the region. As a man of impeccable taste and specific style, Maharajah Sir Ganga Singh carefully supervised the artists, masons, and builders to ensure his concept was properly executed. The palace was constructed using pink sandstone, brought from the stone quarries of Dulmera, boasting a brilliant palate to complement the intricate symmetrical structural design. Boasting colonnaded corridors, canopied balconies adorned with intricate filigree, and wooden and stone lattice work, the brilliant craftsmanship of the estate's exterior was completed with marble courtyards and whimsical fountains amid immaculate gardens. Attributing to the Maharajah's specific artistic vision, the palace interiors were equally vibrant, displaying carved friezes, ornate ceilings, Usta artwork, and expansive golden frescoes and murals depicting cultural scenes. 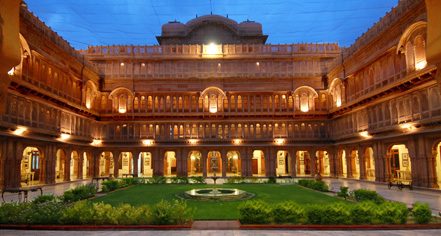 The magnificent palace was named after the Hindu Goddess of wealth, prosperity, and beauty, Laxmi. As the consort of Narayana, the all-pervading manifestation of The Supreme God Vishnu, Laxmi represents good luck and fortune that radiates through the halls of the palace. Upon its completion, plans were made to expand the estate into the much larger Lalgarh Palace, presently comprised of several palace houses. 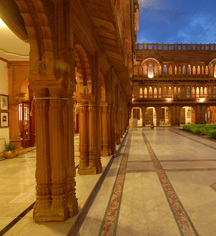 Used exclusively as the private residence for the Royal family and their guests, Laxmi Niwas Palace commanded over Bikaner in all its opulence. With a flair for hospitality, the Maharajah hosted numerous luminaries and dignitaries, including King George V and Queen Mary, the King of Greece, viceroys, fellow Maharajahs, and renowned statesmen. At the turn of the 21st century, Laxmi Niwas Palace was converted into a magnificent luxury hotel, celebrating its significant heritage with thoughtfully-preserved historic elements.